To continue the week of Fairy Tales I went in search of some products on Etsy with a little fairy tale inspiration in there background. These where among my very favorite finds. Special little side note clicking on the links will take you directly to the artist Etsy shop, clicking on the artist name will take you to their Bio page or website. Don't you just love Etsy...happy shopping folks. I would be thrilled to hear from my readers what your favorite fairy tale inspirations are? 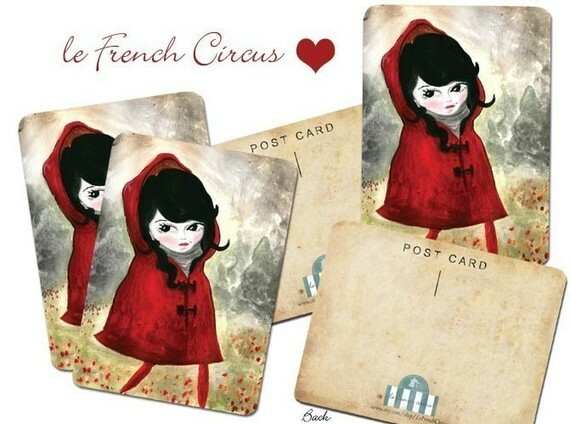 These adorable Little Red Riding Hood postcards are just perfect for handwritten note to grandma's house snail mail style. The stunning artwork featured on these fairy tale post cards is the creation of Marie Letourneau children's book author and illustrator based in New York. The postcards sell for $12.00 for a set of 8 plus shipping. 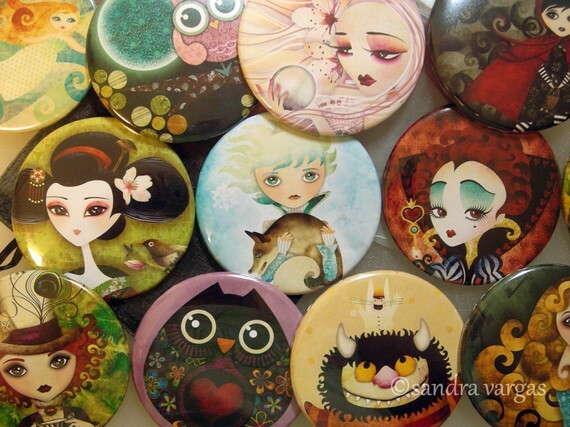 Fairy Tale flair featuring reproductions of artist Sandra's original illustrations. These brightly colored buttons are the perfect accessory to boring totes or make great stocking stuffer. This Fairy Tale inspired buttons sell for $4.50 each plus shipping. Snow White inspired locket made by the crafty hands of Melissa Nucera. 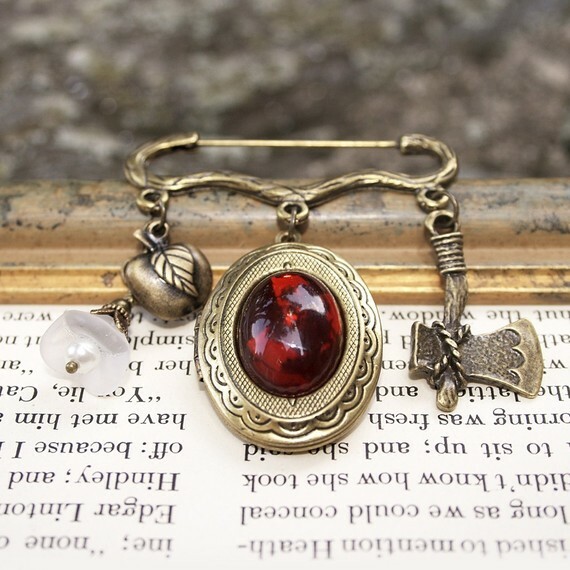 This beautifully whimsical vintage style locket will cost you $21.50 plus shipping. 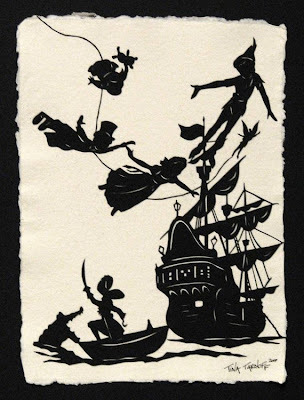 Peter Pan original paper-cut art is so very fun. This paper art was careful done by Tinatarnoff a San Francisco based artist. I personally think this piece would be darling in whimsical nursery. The price of these piece runs at 85.00 dollars unframed plus shipping. Thanks for including my brooch in this beautiful Fairy Tale collection! Lovely blog Jaime! Many thanks for including my buttons!! I really dig those buttons. Very, very cool. And thank you for your comment on my blog and the cool quotes. Much appreciated. Take care and have yourself a great weekend. The older I get, the more I love fairy tales! I really need to devote more time to painting some. Love your blog! Full of beauty . . . thanks! And thanks for stopping by the other day!